Bruno Mathsson’s series of Cleft Leg Tables from the late 1940’s are typical of the designers work from this period testing the possibilities of bent wood. The supporting cleft legs in laminated beech sharing the same soft organic curves as his bentwood chairs. of Alder wood, edge glued with transverse cross band veneer and finished with longitudinal top veneer balance on both sides. Swedish Alder wood (Alnus Glutinous) is used as it is resistant to changes in humidity and excellent stability. The core of solid timber provides the craftsman with a sound base for necessary fixings and machining so that edges are not necessary. 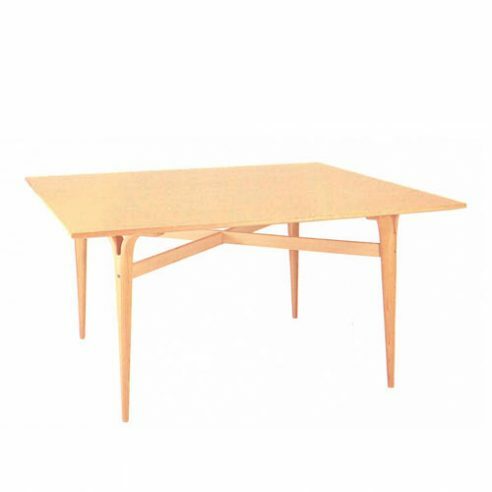 The construction is extremely strong with minimum deflection under load removing the necessity for structural under frames giving the Mathsson tables their light airy appearance.